Have you ever done a plank before, if yes, you really know how long each second can REALLY feel. But apart from all the burn that a plank cause, you can’t ignore all the benefits a plank can really provide. Thos 60 seconds feel like hell, but here’s what really amazing is happening to your body. Did we say metabolism yet? Planking is a great way to get your core running. Doing them every day will burn more calories than any other classic exercise like crunches. Anything is better than doing crunches right? Ladies we all know that a good posture can be a total game changer. And with all our lifestyles, it’s easy to get a slouchy posture these days. But fear not, doing planks is going to fix that. It ll help you to stand strong and perfect. 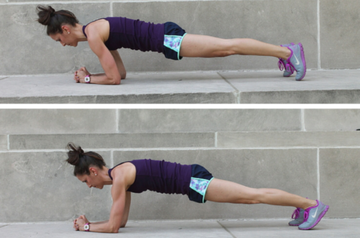 Planks engage the muscles that really play a huge role in toning that body. Your abdominal muscles will thank you for doing planks. It's basically doing ground work to get those abs in shape. Planks help to get an overall stretch which in turns help you to be perfectly flexible. We are hoping this inspires you to get on that mat and slay that plank. Here is a two week plank challenge you can start to get that core in action.